There hasn't been anything new that I've purchased - or even anything out there that I want to purchase. Here's hoping someone comes out with something that I want to buy. No biggie, I've been relistening to The Rising by Bruce Springsteen. Actually, it is Springsteen & the E Street Band, but they're not credited as such on the album title. Truth be told, I'm not what you'd call a 'fan' of Springsteen, and especially the band, but he has his moments - like Tunnel of Love and Nebraska. I was in a bookstore (remember those?) when they were playing The Rising, and I took to it. So much so, that I purchased it right then and there. You can, and other have, call it his post-9/11 album, and I suppose it is. Knowing that, it is hard to listen to it without invoking those overtones. While in the Borders, the first song that came up was "Waitin' on a Sunny Day". In theory, it should have made me walk out of the store. The Mellencamp-esque violin/fiddle, the hick-like accent Springsteen puts on is almost a little too much. Yet, I was intrigued more than turned-off. It's a good record, but not a great one. There are some great songs, but the ones that aren't take the album down a notch. I'll start with the no-so good stuff. "Let's Be Friends" annoys me. 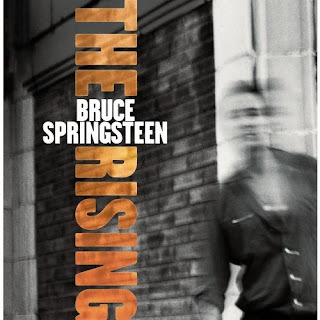 Not typical Springsteen, which in some ways shouldn't be bad, but I can't sit through it. I like "World's Apart"- the pacing the but I have never been a fan of someone who has to put "la la la la" in as vocals. It's lazy and rarely ever fits, and there are so many of them it should have been called "La La La La La". Then there are what I would call the typical Springsteen tunes: "Lonesome Day", "The Fuse", and "Mary's Place" (is he still milking that Mary, from "Thunder Road"?). I love the grit of "Farther On (Up the Road)". It is, for me, the stand-out cut of the disk. It is on a decent rotation through my iPods and iPhone. I thin it is one of his best songs that he's ever done. I like how he provides his own harmonies near the end of the track. Well done. But I really like the title track and "Nothing Man", but really enjoy "Countin' on a Miracle". The above songs surely have some 9/11 undercurrents, but there are more blatant cuts that call that out, including the title track, but there is "You're Missing", "Empty Sky" and "My City in Ruins". Some work well, some are ok.
As an E Street disk goes, it is the a great disk. Bruce himself has better solo records, but using Pearl Jam's longtime producer Brendan O'Brien wasn't a bad idea to help pull this off. You can't make a Springsteen record not sound like Springsteen, but at least he helps mix it up a bit to make it sound fresher. Most of my readers probably won't go buy it, and that's cool, but some of it is worth sampling via iTunes if you're interested. Check out the movie "Walk on Water" which features Tunnel of Love as part of it's soundtrack. It's a great movie that inspired me to travel to Israel last year.